Lonza has built up expertise, capacity, and capabilities in pluripotent stem cell research and their application to cGMP manufacturing. 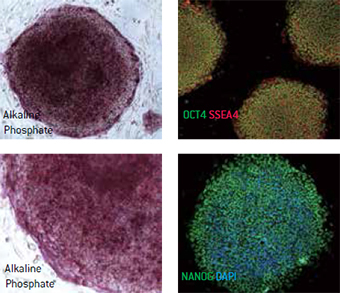 Researchers can now access this expertise through our PSC service oering from iPSC generation to process development and dierentiation. markers POU5F1/OCT4 (green) and SSEA4 (red) counterstained with DAPI (blue).